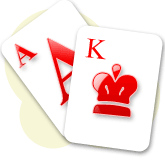 Ace-King, especially when suited, is a very strong starting hand in No-Limit Holdem Poker. However, unless you connect with the board you will have only an ace-high hand to show down at the end. This makes playing ace-king problematic in some circumstances. This article will look at some of the important no-limit Holdem strategy considerations when playing ace-king. These include your stack size, position at the table and the tendencies of opponents who are already in the pot, and those yet to act. The worst possible outcome for ace-king is to be in a multi-way limped pot out of position and then to miss the flop. Under these circumstances the hand should usually be folded to any serious betting action from opponents. Ace-King is a hand that you definitely do not want to be playing against multiple opponents. Ace-king is in fact a drawing hand – you will usually need to improve to win a showdown. At the same time this hand has a strong likelihood of improving to become the best hand, any ace or king on the board will give you top pair with top kicker. This makes ace-king a hand to play strongly and positively until you encounter resistance, both before the flop and in later betting. The ideal situation with this hand is that you take control before the flop by playing aggressive and positive poker. Raising, especially from position, will thin the field – ideally to a single opponent. If that opponent checks to you on the flop you will often be able to take the pot away from them with a continuation bet. When this gets called you have the added advantage of being able to see the river for free if your opponent checks to you after the turn. You might like the multi-way cbetting video for strategy on dealing with tricky flops when facing 2 or more players. Hand 2 (3:22) and Hand 5 (12:36) use AK as examples. Stack sizes and playing ace king. The stack size of both you and opponents in the hand are a critical factor in playing ace-king. If the effective stacks (shortest stack in play) are small then your best move is often to get all-in before the flop with this hand. This is common in tournament situations and has two possible outcomes both of which are positive. If you are up against small stacks, you should try and get all-in before the flop with ace king. Either the pre-flop raiser (plus any caller) folds allowing you to take a good sized pot. Or if you are called – for example by a pair lower than Kings – you get to see all 5 board cards to improve your hand. This means you are only a little under 50% to win the hand – your pot equity will also be increased when there is blind money or a 3rd player who entered the pot then folded to your re-raise. When you have a deep stack holding ace-king a pre-flop re-raise can give you valuable information on your opponent's hand. For example an opponent raises 3 times the big blind from middle position and you re-raise a total of 8 or 9 blinds from the button. When you're opponent is holding the hands you really fear – pocket aces or kings – he is likely to put in a re-raise here. Be wary of 3-bets when you are deep stacked after making a re-raise with ace-king. This could very well mean that your opponent holds aces or kings. However, pairs QQ and below and other ace-high hands are more likely to call. Not only have you defined your opponents hand, you have taken control of the hand before the flop – putting you in a position to take the pot away fairly often those times that you do miss the flop. The tendencies of specific players, and indeed the table dynamic as a whole, will also affect the way that you play ace-king. Before the flop you may raise to isolate a particularly weak player seated to your right. However when a 'rock' in the same seat has entered the pot a flat call may be the best strategy – as such an opponent is more likely to tell you whether they liked the flop with their post-flop betting patterns. Another opponent specific move occurs at a 'wild table' here you can flat call a raise from early position in the hope that a wild player later in the betting will re-raise, you can then push all-in over the top representing aces or kings. When called you still have very good equity against the wild player's range – in addition to the overlay of the dead money in the pot. Since ace-king does not play well in a multi-way pot caution is required with this move – you need to be sure that an opponent will re-raise ahead most of the time. When the betting gets heavy ahead of you a good rule of thumb for playing ace-king, especially when not too deep stacked, is to be the player making the all-in bet and not the one calling this. Ace-king is almost 50% to win against pairs Q-Q and below and 30% to win against pocket Kings. However, when you are the player making the last big bet you have the added benefit of fold-equity. The chance that you're opponent may fold increasing the profit from playing this hand considerably. How to play ace king evaluation. Good no-limit Holdem play with ace-king involves all of the factors discussed above – but also and awareness of how they work together. For example a re-raise from position to define your opponents hand is only useful against a reasonably competent opponent, from position and with a deep stack. Against a weaker opponent or with a short stack (15 blinds or less) your best move might be to push all-in immediately. The combination of 'fold equity' with your winning chances giving this play a positive expectation.